The Institute is a nonpartisan, not-for-profit research organization. Under the leadership of its Founding Director, Randall Larsen, the Institute provides a wide range of educational and consulting services including: half- and full-day seminars, keynote speeches, conference/workshop planning and leadership, simulation/war gaming development and facilitation, Congressional testimony, monographs, journal articles and op-eds, plus private tutorials for corporate and government leaders. Larsen and his associates assist senior leaders from both the public and private sectors recognize and understand the challenges and opportunities of homeland security. Homeland Security: Inside and Out is a public radio show featuring interviews with key leaders at the federal, state and local levels of government plus senior leaders in the private sector, academic community, and national press. Recent guests include: Secretary of Homeland Security, Chairman of the House Security Committee, a 9/11 commissioner, former governors of Virginia and Wyoming, former police and fire commissioner of New York City, state adjutants general, state homeland security directors, and leading homeland security reporters from USA Today, CNN, NPR, UPI, Congressional Quarterly, National Journal, UPI, and the New York Times. 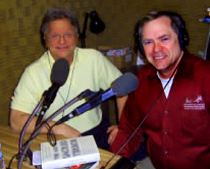 Listen to a radio show demo. Larsen advocates a seldom used tool to fight terrorism—common sense. 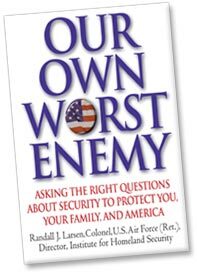 Our Own Worst Enemy is the single best thing that has been written on homeland security and, as Randy Larsen suggests, every American should read it. Straight talking, full of common sense and written in an entertaining style that makes it hard to put down, this book asks the right questions and provides concrete recommendations that government officials, corporate executives and every citizen need to understand and apply. Wall Street Journal: What if the FBI is Right About Bruce Ivans? USA Today: "Traveler's card might just pave the way for a national ID card"
ATLANTIC STORM: Principal designer of one-day executive simulation that examined the response to a biological attack on Western Europe and the United States. View BBC video clip. OIL SHOCKWAVE: Principal designer of a one-day executive simulation that examined the immediate and long-term implications of a major disruption in oil supplies. View Oil Shockwave video. GUARDIAN EAGLE was a two-day audience interactive simulation for the 300 attendees at the McGraw-Hill Homeland Security Summit and Exposition in the Washington DC Convention Center. TERMINAL RISK was a one-day, no-notice executive simulation that examined the capability and readiness of the Environmental Protection Agency's Senior Scientist Response Team. © Copyright 2008 The Institute for Homeland Security. All rights reserved.